High above the blood soaked trenches of the Somme during the Summer and Autumn of 1916, the Royal Flying Corps were acting out - and winning - one of the first great aerial battles of history. Even in those pioneering days of flying, primitive aircraft flown by brave young men were of significant military value. Before the battle, photographic reconnaissance aircraft from both sides were desperately trying to map the opposition's deployment. Artillery spotting aircraft were proving invaluable in directing devastating fire onto otherwise hidden targets. Bombing raids became a normal routine. 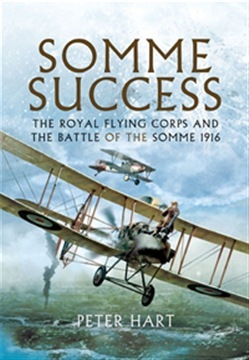 Somme Success is a highly effective description of all facets of air operations of the period. It uses the voices and accounts of those who were there. It describes how the RFC met the Fokker scourge head on using DH2 single seaters and, later, the ubiquitous FE2B two seaters, of the type that German 'Ace' Max Immelmann was shot down by. Having conceded air supremacy to the RFC early in the offensive, the German Air Service launched an aerial counter attack during August and September. The elite scout squadron led by Oswald Boelcke raised the stakes and their Albatross single seaters proved superior to any allied aircraft. Richthofen then appeared on the scene and a new period of German supremacy began. This is a thrilling account of the dramatic events of the period and an insight into the 'glamorous' world of the Great Aces. Acquista Somme Success in Epub: dopo aver letto l’ebook Somme Success di Peter Hart ti invitiamo a lasciarci una Recensione qui sotto: sarà utile agli utenti che non abbiano ancora letto questo libro e che vogliano avere delle opinioni altrui. L’opinione su di un libro è molto soggettiva e per questo leggere eventuali recensioni negative non ci dovrà frenare dall’acquisto, anzi dovrà spingerci ad acquistare il libro in fretta per poter dire la nostra ed eventualmente smentire quanto commentato da altri, contribuendo ad arricchire più possibile i commenti e dare sempre più spunti di confronto al pubblico online.